​A single cannon shot at midnight heralded he arrival of 2019, followed by the singing of Auld Lang Syne. A dazzling array of fireworks then began bursting from the roof of the Civic Centre building, signalling the start of 2019 and captivating crowds packed into the Octagon. The display brought to a close a lively New Year's Eve party in the city centre. Just before midnight, police at the scene said no arrests had been made at the event. However, as families departed and turned over the streets to bar-goers, officers in the various public safety teams patrolling the central city were anticipating some trouble. Earlier, an eclectic mix of locals and tourists made their way to the Octagon for an evening of music, dancing and the five-minute fireworks display, while Octagon and Stuart St bars were full. From 10pm, Kelvin Cummings and the Oxo Cubans blasted out covers, ranging from Another Brick in the Wall by Pink Floyd to Happy by Pharrell Williams. Oamaru retro rock 'n roll, blues and swing band Dee May and the Saints kicked off the New Year's Eve concert about 8pm. Police were out in force and were seen dealing with several distressed and intoxicated people, in some cases escorting them to Dunedin Central Police Station. It appeared some revellers could not wait until midnight for the fireworks, as the regular bang of Roman candles could be heard from streets near the Octagon. However, police were refusing to be drawn until later on Tuesday morning on the number of arrests made for disorderly behaviour, or drivers picked up for excess breath alcohol. Early rain in the city cleared and it was mild, with MetService predicting the temperature would stay about 15degC. Dunedin City Council community events co-ordinator Marilyn Anderson said people were reminded not to bring personal fireworks or alcohol to the Octagon event "to ensure a fun and safe night for everyone". Public buses would also run until about 1.30am to help people get home afterwards, she said. 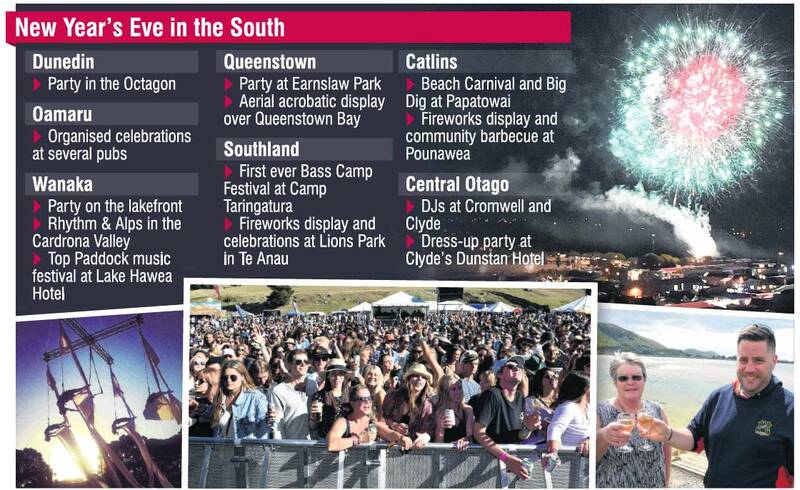 Elsewhere, the New Year was set to be celebrated in style throughout the South with festivities including the first Bass Camp Festival in Southland, a beach carnival at Papatowai, fireworks in Pounawea and an aerial acrobatic display over Queenstown Bay - thought to be a New Zealand first.